Realtek High Definition Audio Driver R2.76 For Windows. Download Realtek high definition audio drivers for Windows 7 32-bit and 64-bit. The Realtek HD audio driver codecs installer package exactly meets the minimum requirements of Microsoft’s Universal Audio Architecture. If you are seeking to download High definition audio driver from Realtek to maximize your Intel ICs build motherboard sound system then go for Realtek High Definition Audio Driver update installer the will ensure support for 7.1 sound playback, plus 2 channels of independent stereo sound output from stereo output panel. Realtek HD audio driver is compatible with Windows Vista, Win7 and Win8 32/64-bit versions. Soon after installation package of Realtek High Definition Audio Driver updated software version you will come to know prevention of audio errors in PC and maximize audio quality with easy to use Realtek tool. Realtek’s present driver update supports for new ALC codecs: ALC891, ALC667, ALC236, ALC256, and ALC293. Realtek HD audio driver package installer setup is easy to run and takes a few seconds 100% works with Windows 32-bit and 64-bit Operating systems. Click the file link to download the file from the Web page. Double-click on the .exe icon. Then you may see a dialog stating "A program needs your permission to continue". If you see this dialog, click on Continue. Click Next. Read the license agreement. That’s it you made it simple. 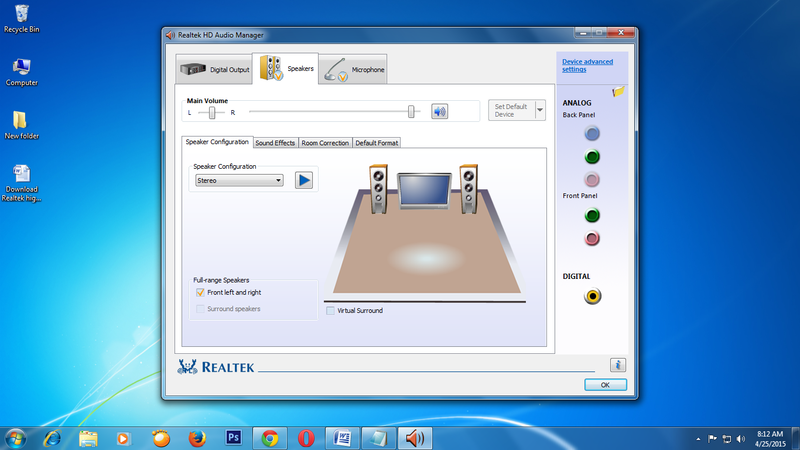 Now you can experience the more improved audio system bundled with Realtek audio manager customization tools.